Sterling silver Celtic bracelet for men is a heavy and thick design that features an engraved double knot-work motif along with 10K gold accenting. This Celtic bracelet for men is a 3/8" wide bangle style that features an engraved double knot-work design in the center along with engraved edges. 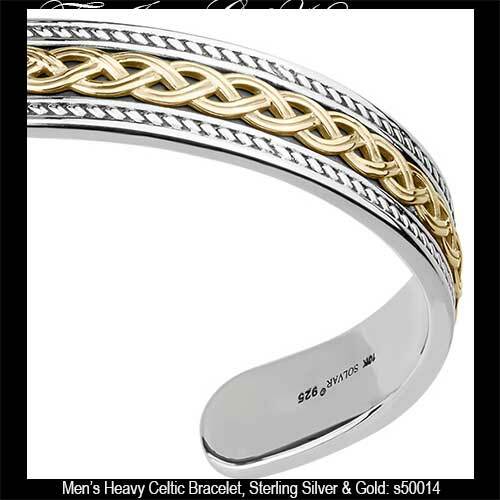 The heavy Celtic bangle is 51 grams of precious metal and will fit most men's wrists. The sterling silver Celtic bracelet is accented with 10K gold and is made by Solvar Jewelry in Dublin, Ireland. 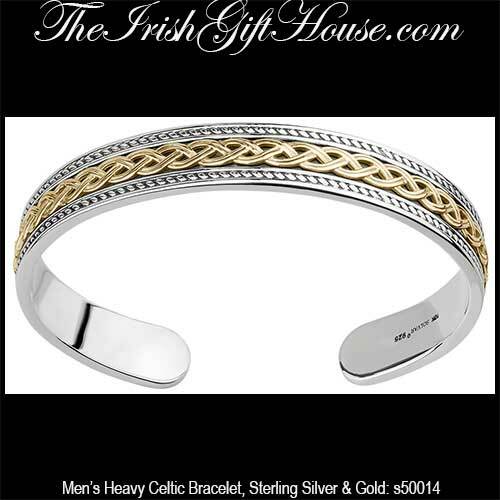 This piece of men's jewelry is gift boxed with a Celtic knot history card, complements of The Irish Gift House.